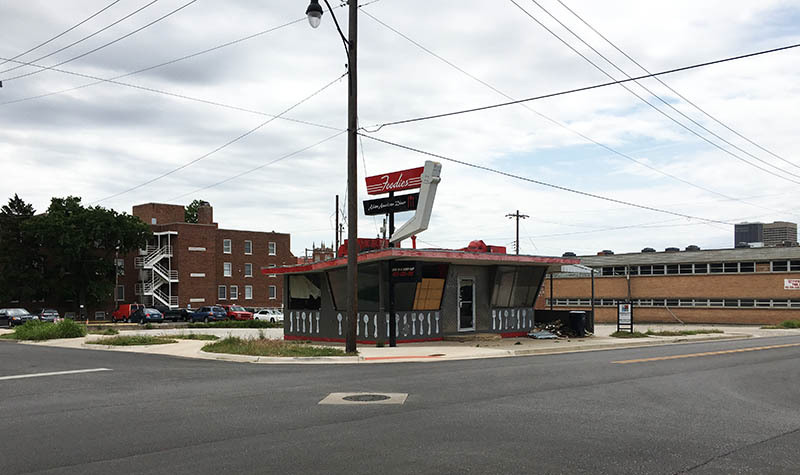 A vacant diner in a prominent Midtown location is set for a makeover into an indoor / outdoor restaurant and bar. 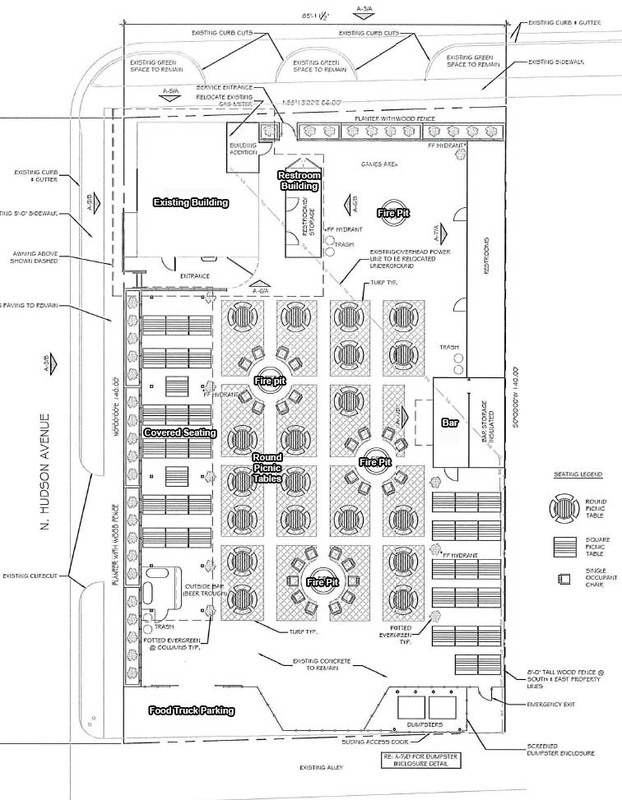 Plans for the former Foodies building at 1220 N. Hudson show the large surrounding parking area converted to a patio complete with fire pits and shade structures. A free-standing restroom and bar will also be added and the tiny existing restaurant building will also be renovated. The plans also show a spot for a food truck along the south end of the parcel. The operation will be piloted by Joe Jungmann, the owner of Sauced on Paseo and the Paseo Grill. Jungmann also worked with the Hal Smith Restaurant Group to help open KD's Southern Cuisine and Wes Welker's Sports Bar. Local attorney Dale Cazes is also a partner. The menu is under development. That patio is huge! Glad to see this building being brought back to life, even though I miss foodies. I miss Foodies and their Bulgogi fries!.. so glad to see this building getting some much needed love. Looks like a great spot!. can't wait to see it progress. Yes, those fries were so delicious. Is Foodies still in business somewhere else? This seems like Midtown's attempt @ a Pump Bar. I like it. Screw the parking lot, make it a giant patio! FOUR FIRE PITS???? That's ALLSOME!!! Do you know who the chef will be? I like that they're going with turf vs. decomposed granite. Looks like a mixture between the Pump and BG. Will food only be available via food truck? Or will there be a separate kitchen? If only the food truck, this is very similar to Bleu Garten. There will be a kitchen in the existing building. They had moved to a location next to where Pancho's used to be but only lasted a short amount of time there. I've lost track of them since then. This would be a great place for live music! Live music might have a tough go of it, owing to the proximity of the Seiber. Certainly it will be problematic late. Simply the size of the place will produce lots of ambient noise on its own, if it is successful, which it should be without question. For reference this is WAY closer to the Seiber than The Pump is to the homes of the individuals who have been giving them hell over noise. And The Pump is not especially noisy, in my opinion. That said, if I were a resident of the Seiber I would be thrilled to be able to stumble across the street to and from this place, which looks fantastic. By the way, Joe was also longtime GM/Proprietor of Red Rock Canyon Grill. Can't recall if he was the first, but was there for quite some time and ran it extremely well. Not to mention that he's good people. But, but, but, where will they all park? I keed, I keed. Looks like a winnah. Excellent. Stretches activity in Midtown to the north. This will not fly without providing their own parking. It is too high volume. If the Midtown BID fights this, it will be deaad! Besides The Sieber, the Wesley and Palo Duro are senior housing and special need adults. Midtown Renaissance won't contribute any of their parking and The Ambassador is getting ready to gate their lot. The Sieber's parking is already gated and the doctor office is getting ready to gate. The professional offices just north of the site are very strict about parking as well. I prefer the luxury of air conditioning and not being bitten by mosquitoes. Might be more attractive during the winter months. NIMBY! NIMBY! Ha ha just kidding. We love all the life and activity within easy walking distance. Louie's is much closer to a lot more residence than this is to the Seiber and they have live music. Had some friends that lived there, that building could use some excitement. Actually. They don't have to address parking at all. Like specificly. Don't even have any need to provide 1 spot. If they are smart they will get a property attorney to rep them and he/she could shut down any conversation about parking as it is not relevant given the current city code. Anyway, as Bouldersooner said, there are no parking requirements in downtown...so it's not a big a deal at all. No, you're right. I will be shocked if there isn't protest from HH. Well it sure won't be coming from us, or from any of the HH neighbors we know--who all enjoy the nearby amenities. We weren't residents here when the Edge debacle happened. Maybe, just maybe, people in HH have now realized that the new development is *good* for the neighborhood and helps keep our property values high. Maybe.